As part of its final “West Side Connections” program of the 2016-17 season, outgoing LACO Music Director Jeffrey Kahane joins with Los Angeles Philharmonic Principal Keyboard player Joanne Pearce Martin for the west coast premiere of John Adams’ Roll Over Beethoven. Then Kahane joins with LACO Concertmaster Margaret Batjer and Principal Cellist Andrew Shulman in Beethoven’s Trio in B-flat Major (“Archduke”). NPR’s Renée Montagne moderates the program. BONUS: The theatre, part of the New Roads School, is a ten-minute walk from both the Expo/Bundy and 26th St/Bergamot stations on the Metro Expo Line. Franz Schubert is best known for his “lieder” (art songs), but he also wrote eight symphonies, and those orchestral works will form the backbone of a series of May concerts by the Los Angeles Philharmonic. Artistic Director Gustavo Dudamel will conduct two symphonies in each of the four programs and has also programmed four song collections by Gustav Mahler. This weekend, Schubert’s first two symphonies will bookend Mahler’s Songs of a Wayfarer, with mezzo-soprano Michelle de Young as soloist. BONUS: Disney Hall is easily reachable (at least if you’re not mobility challenged) via Metro’s Red and Purple Lines. Exit at the Hill St. side of the Civic Center/Grand Park station and walk west up two steep blocks to reach the hall. MAY 6: RODERICK DEMMINGS, JR. This award-winning organist and pianist — who has performed at Carnegie Hall, Kennedy Center, the Vatican and other prestigious venues — comes to Pasadena to play on PPC’s massive Aeolian-Skinner pipe organ. BONUS: Free admission; freewill offering. After several seasons of traversing French organ music, this year’s “marathon” features music from England, played by Southland organists Namhee Han, Jaebon Hwang, Mary Lee Mistretta, Jelil Romano, Philip Allen Smith, Samuel Salvador Soria, and James Walker. See “Information” below for details as to who plays what when. Artistic Director Stephen Grimm leads selections from “The Great American Songbook,” accompanied by pianist Alan Geier and the Blair High School Jazz Ensemble, Michael Birnbryer, director. This world-renowned children’s chorus — which, despite its name, is based in Pasadena — sings the first of two consecutive Sunday “Spring Concerts.” Artistic Director Anne Tomlinson leads LACC’s Concert Choir and Chamber Singers in the world premiere of Breathe in Hope by Los Angeles-based composer Dale Trumbore, along with music by Holst, Handel and others. LACC’s Intermediate Choir, led by Diane Landis, will also perform on this program. The music of Stephen Sondheim, permeates this jazz-oriented program. Sondheim & Jazz: Side by Side was created by pianists/arrangers Bill Charlap and Renee Rosnes, with Ann Hampton Callaway, that explores the sophistication, wit and genius of one of Broadway’s most innovative artists. In the other half of this program — first or second, depending on which part of the Phil’s Web site you believe — finds pianist/composer Dave Grusin offering his jazz interpretation of Bernstein’s classic West Side Story. This article was first published today in the above papers. Nov. 13, 16 and 21 at 7:30 p.m.
Nov. 24 and Dec. 1 at 2 p.m.
Concert performance: Nov. 26 at 7:30 p.m.
Roberto Frontali stars in a new production of Verdi’s “Falstaff,” which opened last night at the Dorothy Chandler Pavilion. One of the hardest jobs for any opera company is to retire a beloved production for a new one. One has only to look at recent events at New York City’s Metropolitan Opera to realize how fraught with peril such a change can be. 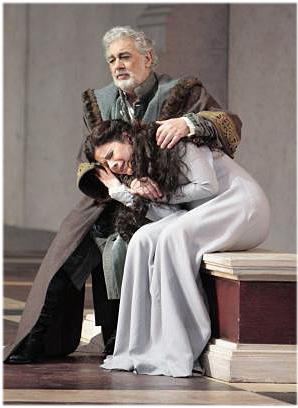 For its opening production in 2009, the Met retired a beloved (by most) 20-year-old Franco Zeffirelli production of Tosca that was a sumptuous, literal recreation of Puccini’s concept. In its place went a stark, symbolized rendering by Swiss director Luc Bondy. The headline for Alex Ross’ review in “The New Yorker” of that opening night summed up many people’s feelings: “Fiasco.” Time has softened attitudes only slightly. Likewise, when the Met replaced its decades-old, literal production of Wagner’s Ring cycle with a quirky new one by Robert Lepage, the results were even more disastrous, to say nothing of far more expensive. So it must be with a bit of baited breath that Los Angeles Opera introduced a new production of Verdi’s Falstaff last night in the Dorothy Chandler Pavilion in the first of six performances with others occurring through Dec. 1. There will also be a concert performance on Nov. 26 at the Renée and Henry Segerstrom Concert Hall in Costa Mesa. The production of Verdi’s final opera — based on Shakespeare’s play, The Merry Wives of Windsor — is being directed by Lee Blakeley, with scenery and costumes designed by Adrian Linford; both are making their LA Opera debuts. Rick Fisher is the lighting designer and Nicola Bowie is the choreographer. This replaces an historic production that originated not with LA Opera but with the Los Angeles Philharmonic in 1982. What made that production special was that the Phil’s Music Director, Carlo Maria Giulini, was conducting the opera, something that he had not done for 14 years. Donal Henahan the New York Times music critic wrote of that night, “For one golden moment, at least, this opera-starved city has become the center of the opera universe.” LA Opera took over the production and revived it three over the succeeding decades. However in this bicennial year of Verdi’s birth LAO General Director Plácido Domingo and Music Director James Conlon elected to mount an entirely new effort. Conlon will conduct all six Los Angeles performances and the concert performance in Orange County. Italian baritone Roberto Frontali will appear in the title role as Falstaff, along with soprano Carmen Giannattasio as Alice Ford and Marco Caria as Ford. Other cast members are Ronnita Nicole Miller and Erica Brookhyser, alumnae of LA Opera’s young artist program, as Mistress Quickly and as Meg Page; tenor Robert Brubaker as Dr. Caius. Feb. 19, 26 and March 4 at 2 p.m.
revival led him to write his final two — and greatest — operas: Otello and Falstaff. Boccanegra for Royal Opera, Covent Garden. Act — the famous “Council Chamber” scene — are quite special. 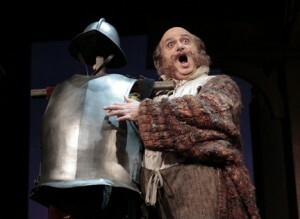 for baritone roles but Domingo has always been unique. with personal demons, as well. but the clock is, regrettably, ticking. end of the sextet to boot. She also brought deep emotion to her acting. Pietro, Sara Campbell as Amelia’s maid, and Todd Strange as a captain. The LA Opera Chorus was effective in the crowd scenes. otherwise but such skill is not to be taken lightly or for granted. David Washburn sparkled as a one-man banda. directed the six scenes skillfully. Opera House in New York City.